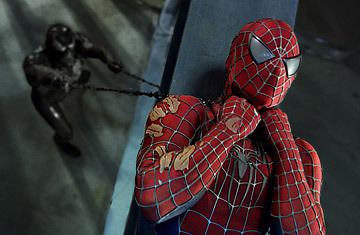 A scene from the film Spider-Man 3. Is Spider-Man Worth $300 Million? The movie audience has been on a post-Lenten fast lately. Last weekend's total take at the domestic box office was only $77.7 million  a most unlucky number for the studios dumping their clearance-sale titles on an apathetic market. For filmgoers, this was the purge before the binge. A heady month is ahead, with Shrek the Third and Pirates of the Caribbean: At World's End ready to pick the public's pockets. And this weekend: Spider-Man 3, which on its own is guaranteed to top last weekend's cume. Anything under a $100 million launch would be disappointing for a threequel with a budget in at least the quarter-billion-dollar range. These days directors of special-effects epics can spend money faster than Tony Soprano at the roulette table. Tony, in moments of crisis, has an anxiety attack or orders someone's death. In Spider-Man 3, Peter Parker (Tobey Maguire), the young-adult nerd with preternatural powers, gets covered in intergalactic black stickum. Once he's gooed, he's bad  bad for him, anyway, which is still better than most of us on our best behavior. He spends much of the movie trying to resist the temptation of outlawry, the nefarious fashion of basic black. This plot device has tested the credulity of some early viewers of Spider-Man 3, as I gleaned from snippets of Jon Stewart's chat with Maguire on Tuesday's Daily Show. "Here's what I buy," Stewart said teasingly. "A supergenetic spider bites you on the hand and you yourself take on some of the characteristics of a spider. [But now] apparently something falls from outer space and it turns into a black suit. And that for me is where the Spider-Man series, y' know, loses its believability." Plausibility isn't the biggest challenge for the comic-book-movie fan base. Sentimentality is. An Ain't It Cool News review, supposedly written by the mother of a friend of AICN critic Moriarty, tosses Spidey 3 into the sar-chasm by informing us that "There's only about 25 minutes of actual Spidey footage in this movie  which makes all kinds of room for: That darling Mary Jane singing (two songs!). Peter Parker crying. Harry [Osborn] crying.... The Sandman crying. Eddie Brock crying. Mary Jane crying. Aunt May crying.... And yes, I might as well tell you, there ARE a few action scenes that get in the way of all the interesting stuff between the characters and their relationships and their ordinary, everyday lives." No question, this is one wet action movie. It sets a world's record for so-called tough guys shedding tears. Harry Osborn (James Franco) gets weepie over his father's death, and enraged at his belief that Peter was responsible for it; he vents his rage in the supervillain guise of the New Goblin. Before being transformed into the irradiated Sandman, Flint Marko (Thomas Haden Church), the recidivist hoodlum  and murderer of Peter's sainted uncle  goes all soft and moist as he clutches his young daughter's locket. Peter has a jewelry fetish too: his aunt has given him her wedding ring, which he plans to present to his girlfriend Mary Jane (Kirsten Dunst). But our hero has more urgent concerns. His protracted adolescent funk has given way to an anxiety crisis, from which his ability to soar over the city saving lives cannot extricate him.